The fuel cell has a proven history with solid oxide based systems. Recent needs for miniaturization have generated new ideas of fuel sources and structures. These include direct methanol fuel cells (DMFCs) and polymer electrolyte membrane fuel cells (PEMFCs). These fuel cells have advantages over others for several reasons. A key quality is the potential energy that the fuel sources provide with respect to the fuel costs. For use in portable electronics, the fuel cell products must be manufactured to fit similar battery form factors. 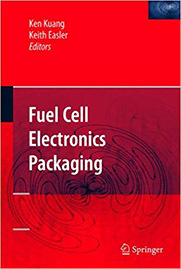 To achieve these mechanical size limitations, fuel cells must be manufactured with materials that permit small features allowing fuel and airflows, electrical connections, and a membrane assembly. In addition, these materials must survive in high temperatures, acidic environments, and remain leak proof. Alumina ceramics have been demonstrated to perform with these requirements using standard multilayer manufacturing techniques employed widely by the semiconductor industry. This research focuses effort on the development of the structure and features of the ceramic separator and the long-term test results.